Background The ‘Golden Hour’ emphasizes the importance of rapidly providing definitive care to trauma patients. Dispatch time, defined as the time it takes the Helicopter Emergency Medical Service (HEMS) to dispatch from their base and reach the patient, and on-scene time, defined as the time spent with the patient prior to departure to a trauma center, can impact how quickly the patient will reach definitive care. We evaluated HEMS dispatch and on-scene times by investigating the survival rates among patients transported by air to a level 1 trauma center. We hypothesize that longer HEMS dispatch and on-scene times are associated with worse patient outcomes. Methods A retrospective, single institution analysis was performed on patients transported by HEMS. Inclusion criteria were air transported patients aged 18 years and above admitted to a level 1 trauma center from January 1, 2005 to January 1, 2015. Total dispatch time and on-scene times were divided into five incremental groups and mortality data were analyzed. Mortality was defined as death during initial hospital admission. A Pearson’s correlation was used to analyze relationship between dispatch times, on-scene times, and mortality. Simple binary logistic regression was used to run a multivariate analysis on confounding variables of Injury Severity Score (ISS), gender, age, and Glasgow Coma Scale. Results There was a strong positive linear correlation between HEMS on-scene time and mortality, R=0.962, p=0.038. Additionally, there was a positive trend between HEMS dispatch time and mortality. ISS was found to be a significant confounder of mortality in our cohort with on-scene times >20 min, with mortality increasing by 7.5% for every 0.1 increase in ISS score (p=0.01). Conclusion Longer HEMS on-scene and dispatch times appeared to be associated with increased mortality in trauma patients. However, those with higher ISS require longer on-scene times, increasing mortality. Regardless, efforts should focus on reducing on-scene and dispatch times. Level of evidence and study type Level III; Therapeutic/Care Management. Obtaining definitive care within this window can be difficult for trauma patients residing in rural locations. As opposed to larger, urban hospitals with more resources, many small, rural hospitals and emergency clinics are not equipped to treat severely injured patients. The transportation time to a larger hospital for rural patients can greatly surpass the ‘Golden Hour’. It is generally accepted that a trauma patient has improved outcomes if they reach definitive care as soon as possible. However, do specific time frames within the transportation process exert a larger impact? Rhinehart et al states that shorter dispatch times are associated with better patient outcomes,3 and Rogers et al mentions the ‘Platinum 10 min’ of on-scene time.4 Dispatch time, defined as the amount of time it takes for the emergency provider to reach the patient, and on-scene time, defined as the total time it takes for them to leave with the patient once it arrives at the scene of injury, can greatly influence how quickly the patient will reach definitive care, but also imply different processes. The first 10 min of prehospital care will be investigated in this study. Each year, trauma accounts for 41 million visits to the emergency department (ED).5 In 2003, 14.2% of all ED patients were brought in by emergency medical services (EMS),6 which includes ground and air ambulances. In certain circumstances, helicopter emergency medical services (HEMS) have advantages over ground transportation. For instance, HEMS are able to travel distances significantly faster than ground EMS, which allows for a more rapid transportation of severely injured or rurally located patients to a large hospital. HEMS are often equipped with more experienced medical crew that should improve on-scene management and patient triaging.7 Similar to ground transportation, there are also inherent risks and disadvantages with air transportation, which include the risk of crashes or accidents, small cabin size, and high cost. Furthermore, many factors must be considered before flight, such as how much the crew and patient weighs, weather conditions, air traffic, and amount of fuel on board. With its extensive area of coverage and increased velocity, HEMS are better than ground transportation in reaching rurally located trauma patients faster and allowing them to reach definitive care in a shorter amount of time. To this end, we aim to access HEMS dispatch and on-scene times in a West Texas cohort by investigating the survival rates among the trauma patient population transported via HEMS to University Medical Center (UMC), the level 1 trauma center in Lubbock, Texas. We hypothesize that a longer HEMS dispatch and on-scene times are associated with worse patient outcomes. A retrospective review of data from the UMC Trauma Registry was performed on the outcomes of trauma patients transported to ED by HEMS. UMC is the only level 1 trauma center between El Paso, Texas and Fort Worth, Texas. It serves the greater part of West Texas and eastern New Mexico, with one out of five EMS transported patients arriving by air. There are two HEMS providers that transport patients to UMC. A total of 12 helicopters and 7 fixed wing planes are dispersed among 29 heliports throughout West Texas and eastern New Mexico. Texas Tech University Health Sciences Center Institutional Review Board approval was obtained for collecting the data and reporting on its analyses. Air transported trauma patients, aged 18 years and above, admitted to UMC from January 1, 2005 to January 1, 2015 were analyzed. Patients were excluded if they were transported by air from another hospital or if they died before reaching the ED. Data were collected from the hospital trauma registry and electronic medical records, which included the following: age, gender, Glasgow Coma Scale (GCS), Injury Severity Score (ISS), hospital length of stay (LOS), mechanism of injury, dispatch time of HEMS, on-scene time of HEMS, total transport time of HEMS, and mortality were abstracted. Dispatch time was defined as the time (in minutes) it takes for HEMS to arrive to scene. On-scene time was defined as total time (in minutes) on-scene spent with the patient prior to departure to our trauma center. Total dispatch time and on-scene times were divided into five incremental groups: (0–10, 11–20, 21–30, 31–59, and 60+ min). These time intervals were investigated to determine whether a specific length of time in the air and on-scene time have a significant impact on patient mortality. 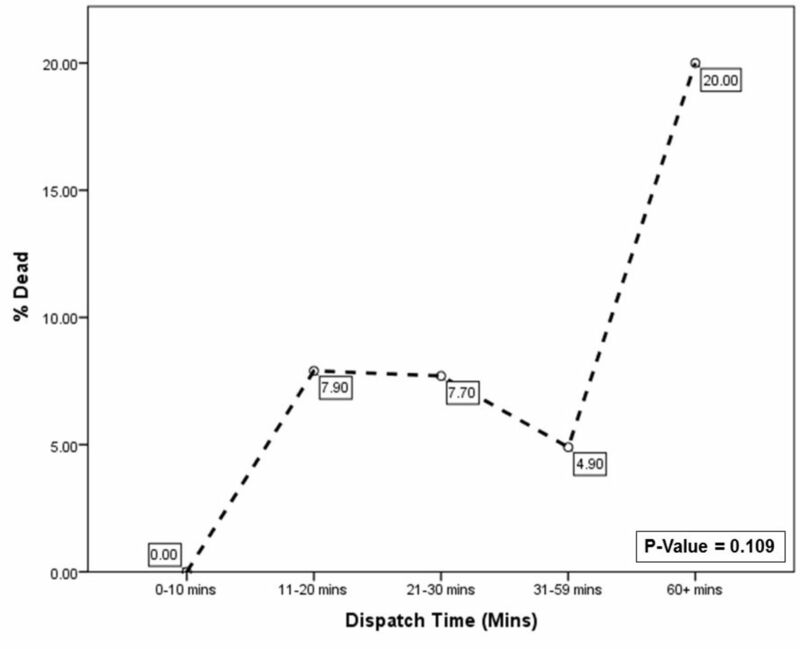 A Pearson’s product-moment correlation coefficient was used to assess the relationship between time to arrive on-scene by HEMS as well as dispatch times to mortality in trauma patients. Simple binary logistic regression was used to test for confounding variables of age, gender, ISS, and GCS for on-scene times >20 min, as >20 min of on-scene time correlated with higher mortality in our results. A total of 288 trauma patients were air transported to UMC during this time period (table 1). Of these, 42 (14.5%) patients had dispatch times less than 10 min and 73 (25.3%) patients had on-scene times less than 10 min. The mean age, GCS, ISS, and LOS were 40.8 years (SD 17.6), 11.7 (SD 5.1), 14.8 (SD 11.9), and 7.8 days (SD 8.6), respectively. Death occurred in 22 (7.64%) patients. There were 264 (91.6%) patients with blunt trauma and 24 (8.3%) patients with penetrating trauma. The mean total dispatch to scene time, total scene time, and total transport to hospital time were 19 min (SD 12), 42 min (SD 29), and 58 min (SD 40), respectively. Helicopter Emergency Medical Service on-scene time and trauma patient mortality. Helicopter dispatch time and trauma patient mortality. Trauma patients with a dispatch time between 0 and 10 min had a lower mortality rate (0%) compared with patients with longer dispatch times. Patients with a dispatch time lasting >60 min had the highest mortality rate (20%). A simple binary logistic regression analysis was conducted to predict mortality in trauma patients transported via helicopter with on-scene times >20 min accounting for age, gender, GCS, and ISS score as confounding variables. Nagelkerke’s R2 of 0.472 indicated a mild to moderate relationship between prediction and grouping. Prediction success overall was 89%. The Wald’s criterion demonstrated that only ISS score made a significant contribution to prediction (p=0.01). Trauma patients in the 0–10 min cohort had an average ISS of 9.97, compared with an average ISS of 16.54 in the 31–59 min cohort (table 4). Gender, GCS, and age were not significant predictors. Exp(B) value indicates that when ISS is raised by 0.1, mortality increased by 7.5%. Baseline characteristics of on-scene time cohorts. In this study, we sought to investigate specific time frames within the ‘Golden Hour’ in air transported trauma patients and its influence on patients' outcomes. Since the introduction of helicopters EMS, the benefits of HEMS on patient outcomes has been greatly debated. Some studies show improved patient outcomes with shorter transport times,8 9 while other studies suggest that extended transport time does not lead to poorer outcomes.10–13 Our observations suggest that faster on-scene times is associated with lower mortality. There was no significant relationship between >60 min of total transport time and morality rate seen in our trauma patients. Majority of our cohort had total air transport times lasting longer then the ‘Golden Hour’. Although the principle of the ‘Golden Hour’ was not appreciated in our data, there was a clear linear relationship between longer on-scene times and mortality. Although the first 60 min after injury are considered some of the most sensitive minutes in the patient’s life, some believe that the first 10 min of prehospital care administered to the patient are the most important.4 This short time interval, known as the ‘Platinum 10 min’, may be evident in our data. Critically injured patients with on-scene times that fell within the 0–10 min time frame appeared to have lower mortality rates. 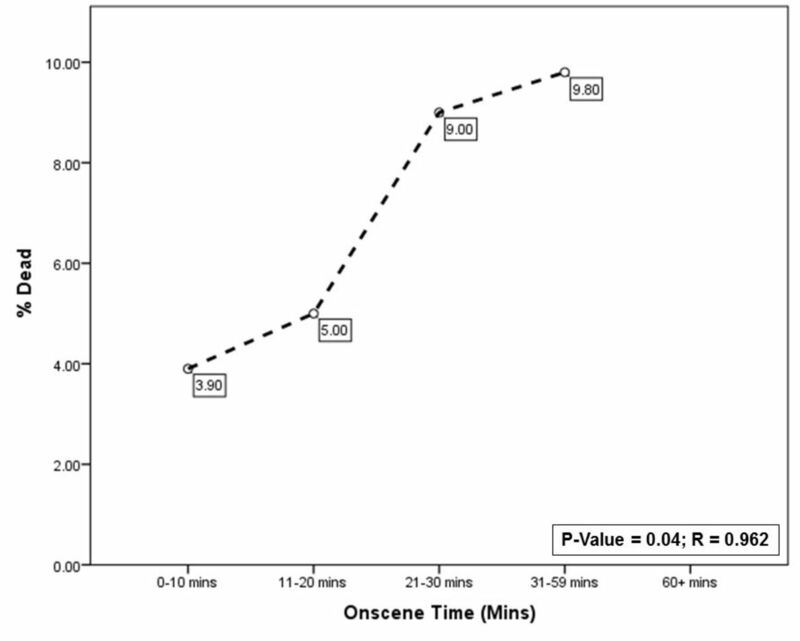 In addition, trauma patients with on-scene times lasting >10 min had increased mortality. A short on-scene time implies that the patient was quickly attended to, stabilized, and loaded into the vehicle within a few of minutes. Longer on-scene times could perhaps indicate less efficient prehospital care. Furthermore, the first 10 min of total HEMS transport time, which generally consists of the helicopter dispatch, seems to be predictive of trauma patients’ outcome. If the helicopter can reach the patient and provide prehospital care within 10 min from arrival, trauma patients had increased survivability. It has been found that proximity to an airbase, and therefore a shorter dispatch time, is associated with reduced mortality in trauma patients.3 The faster the HEMS is able to reach the scene, the faster critically injured patients will receive medical care. It is evident that trauma is time sensitive, especially in its earliest moments, and HEMS provides a faster method of reaching and caring for severely injured patients. The improved outcome of trauma patients in the shorter time increment could be due to the high level of care provided by the helicopter team. While there are only three HEMS personnel on an aircraft at a time, they are efficient at stabilizing and transporting the patient. The HEMS crew is expected to maintain a high level of certification and skill sets that include chest tube placements, arterial line placements, escarotomies, intubation, cricothyrotomy, and much more. In addition, HEMS providers are more familiar with caring for severely injured individuals due to the prevalence of trauma cases they encounter.11 An experienced provider can stabilize and maintain a patient for a considerable length of time and allow the patient more time to reach definitive care without increasing morbidity and mortality. Prehospital care given to the trauma patient could be comparable to the definitive care they would have received in a small rural emergency department. On adjusted analysis with confounders, the correlation of increased mortality with increased on-scene time was no longer significant once ISS was considered. Trauma patients with higher ISS are much more severely injured compared with the rest of the cohort and may require additional interventions or advanced life-saving procedures that increase on-scene time. For example, the patient may need immediate intubation or extrication from a vehicle. It is anticipated that more severely injured patients will have worse outcomes. Higher rates of mortality seen in our cohort may not have been a result of longer HEMS times, but due to severity of injury, which directly influences transport times. However, expedient transport should not be ignored and getting the patient to definitive care as soon as possible should remain a priority. Overtriaging of trauma patients could also explain the decreased mortality in patients with shorter HEMS times. Overtriage could be seen as shorter hospital LOS. Less severely injured patients would require shorter on-scene times, less amount of life-saving interventions, and fewer days of hospitalization. Our data suggest that trauma patients with shorter on-scene times have shorter hospital LOS, which could indicate overtriage in our cohort. Patients with on-scene times 0–10, 11–20, 21–30, and 31–59 mins had a LOS means of 6.4, 6.6, 9.5, and 8.5 days, respectively. Overtriaging in trauma patients, who possibly could be transported safely by ground transportation, leads to the excessive use of costly air transport. While the ‘Golden Hour’ is not necessarily a definitive 60 min, the idea that it represents will continue to be practiced in trauma care. It is imperative that trauma victims receive care as soon as possible, whether it be prehospital or definitive care. From our observations, we have identified that faster time of arrival on-scene and departure from scene are directly related to decreased mortality. Further research will be required to develop a better HEMS dispatch protocol and HEMS disbursement among rural regions that will shorten the amount of time to get to a trauma patient and transfer them to appropriate trauma center. There are some inherent limitations to our study, since this is a retrospective analysis at a single institution. The results of this study may not be representative of the general population, especially since our cohort is primarily from a rural area. Data on extrication times and specific life-saving interventions would have enhanced our study, but unfortunately was not noted in our institutional trauma database. The time recorded on arrival and dispatch was recorded by nursing personnel and may not be completely accurate due to human error. We hypothesized that a longer on-scene time, defined as the total time it takes to depart from the scene with the trauma patient, is associated with increased mortality in air transported trauma patients. Before adjusted analysis, our findings supported our hypothesis in that both dispatch times and on-scene times <10 min are associated with the lower mortality. ISS was found to be a major factor in patient outcome. Those with higher ISS may require longer scene times due to the need for urgent interventions such as extrication from a vehicle or more advanced life-saving on-site procedures, increasing mortality. Regardless, efforts should focus on reducing on-scene and dispatch times. The authors would like to acknowledge the Texas Tech University Health Sciences Center Clinical Research Institute and the University Medical Center Trauma Services Department for approving this study and providing with data to complete this study.
. Mortality in the United States, 2014: Centers for Disease Control and Prevention, 2015. Trauma Statistics. 2014 http://nationaltraumainstitute.net/home/trauma_statistics.html (accessed 1 Sep 2016). This was presented at the American Association for the Surgery of Trauma (AAST) 76th Annual Meeting, Baltimore, Maryland, September 9-12, 2017. Contributors SD and HP participated in study design. HP participated in data acquisition. HP and YP participated in analysis and interpretation of data. HP and YP were involved in the drafting of the manuscript. All authors were involved in the critical revision. Ethics approval The Texas Tech University Health Sciences Center (TTUHSC) Institutional Review Board approved this study.